Born and raised in Provo, Utah, Sandy does not remember a time when she was not painting or drawing. "Art has always been a part of my life, I always knew that was what I wanted to do." After attending Brigham Young University and studying drawing, painting and design, she enjoyed a successful career in the commercial art field in Boston and Los Angeles. 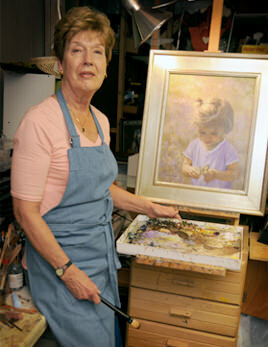 After returning to Provo to raise a family, a burning desire to return to her lifelong passion for painting led Sandy to study with well known artists through workshops and classes. Her creative spirit has been a determining factor in her life. Striving to capture that inexplicable "magic" in the subject matter that she paints is a fascinating and compelling force in her artwork. Sandy has traveled extensively around the world visiting museums for inspiration and to acquire and expand her knowledge. She is currently the President of Utah Valley Artist Guild, an organization that encourages artists and gives them opportunities to exhibit. Her prize winning art can be found in collections in Pennsylvania, Colorado, California, Arizona, as well as private collections and galleries in Utah. She has exhibited at Alpine Art Center, Anderson Gallery at Academy Square Library, Utah County Gallery, Fairview Museum, Coleman Studios, Terra Nova Gallery, Utah State Fair, the prestigious "Utah Image" exhibit in Salt Lake City, Freedom Festival at the Covey Center, Logan Fine Art Invitational, Utah Valley University Library Exhibit, Logan Fine Art 'Salon d'Autumne', and the Spiritual Invitational at the Springville Museum. Sandy and her husband Roger are parents to 4 children and grandparents to 8 grandchildren. Copyright © 2013 Sandra Whitby Art Studio. All Rights Reserved.